For most families, preparing for Halloween fun and festivities is an exciting time. But for families whose children have food allergies, it can be a time of fear, exclusion and frustration. 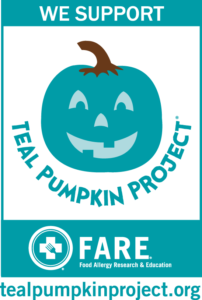 Launched as a national campaign by Food Allergy Research & Education (FARE) in 2014, the Teal Pumpkin Project® raises awareness of food allergies and promotes inclusion of all trick-or-treaters throughout the Halloween season. The goal of the project is to create a safer, happier Halloween for all. Have questions about what to hand out? Visit the FARE website for great information. FARE provides a number of free printable signs, flyers, and materials to help you make the most of this year’s Teal Pumpkin Project®. View all the downloads. How can allergy drops help food allergies? Diagnosing food allergies starts by observing symptoms when troublesome foods are included in a person’s diet. Testing can be done by food challenges or blood work (RAST testing). Blood testing examines the antibody levels to specific foods and has the advantage of being safe and reproducible with few false positives. Once diagnosed with food allergies, treatment options range from avoiding the allergens, managing symptoms, to treating the root cause through immunotherapy. The only way to change underlying allergic disease is immunotherapy. Treating food allergies with sublingual immunotherapy begins at a much lower level than the amount that triggers reactions at the microgram level. This small amount, placed under the tongue, is enough for the immune system to build allergic tolerance over time, yet is below the level which triggers a reaction. The effectiveness of sublingual immunotherapy depends on how often the drops are taken. When using the La Crosse Method™ Protocol for food allergies, we recommend one pump dose, three times a day—morning, noon, and night. The goal of sublingual immunotherapy treatment for food allergy will vary from patient to patient. For those with mild to moderate allergies, it is possible to reintroduce allergic foods into one’s diet while with those allergies are severe and life-threatening, the goal is to reduce the likelihood of an allergic reaction to an accidental exposure. Learn more about treating food allergies.